I am an experienced communicator. Not just a little bit. It’s pretty much the core of all I have ever done in my career. I’ve recently had the aha moment that it’s because of this natural tendency to understand visual cues, translate people’s wants, find middle ground and all kinds of other puzzles that come with sending and receiving messages — that I struggle so much with this challenge I live with every day. It feels like failure to not be able to communicate with my own daughter. It hurts every time I try to guess. She makes unexpected eye contact and grabs my hand. I say something like “are you hungry? Want to play?” But she walks away. Clearly I’ve failed. It’s been a hard existence to feel your hours and days building up and the failures outweighing the successes. We’ve spent many hours together where I just stare at her thinking it will hit me. If I watch her long enough I will be able to crack the code. Then there are also the moments where I’m determined to create the perfect environment to exchange with her. I crash my own pity party, set myself a simple goal and never even think of failing. Because, I just don’t fail at communicating. So here we go folks, welcome to amateur therapy hour… Chair is set. Picture cards ready. Recording button poised. Bouncey ball just in case. Music in the background. Time to work! Nope. Not today she says with her defiant patented Reesey squeal and runs off. I sit frozen, deflated. I catch myself in the mirror and I have to laugh. I tell my son every day it’s ok to fail. Every start up success story seems to come with that lesson learned from failure. I know it’s ok. I know it’s natural. I know the ego will heal just fine; it just burns deep. So recently, we have been getting more frequent wonderful reports from her therapists and teachers about her progress in communicating. I am in awe at how they read her body language, they have found the right rewards, they sing her praises, and they get results. It’s the best part of my day to hear what she has accomplished. And if you’ve known me even for a bit, you probably picked up on my stubbornness. I take these wonderful successes as proof it’s possible, and I get more convinced she and I can do this together. I have decided failing is not an option here. It’s not that I haven’t been listening to myself. I just mean in the long run, we have to succeed for her. We won’t ever give up. So we just keep on truckin’. And I think she recognizes when I’m trying. She lights up or flaps her arms when I am on the right track. It keeps me going — that touching little smile. I know she is just patiently waiting for me to find the right key to unlock the door to her little voice. We are so proud of her accomplishments already. She is so strong in spirit. And I know she wants this as much as I do. Note: This is all one little session that started because she wasn’t falling asleep for nap and I was singing ABC while rocking her. I think the alphabet triggered her interest in her tablet and off she went running. And while the music played some random sound came out. She looked at me with a surprised smile. I mimicked her and her eyes lit up. That’s when I decided she was in the right mood. I rubbed her teeth and pinched her cheeks. Then I stuck my tongue out at her for a while and she was excited and tried to touch it with her index finger. Some times she doesn’t want to look at herself, but when she does, the selfie view gives her instant gratification. So in 5 min I got two rounds of what you see here. Today, that is a success. Previous PostA guilty kind of thankful Next PostAll the Moms in the House say… Caayyy-ake!!! Hang in there you and Bryan are doing great !! Connecting the dots of my ever-changing life. Realizing I'm ok with it, and you should be, too. 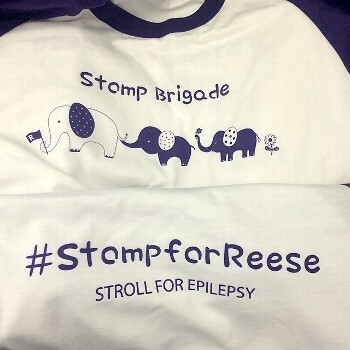 We are walking April 9 at the Dallas Zoo as the Stomp Brigade. Copyright © OKwithChange.com. All rights reserved.